The Saudis are under new world pressure after the murder of Jamal Khashoggi. Nearly four years after the war in Yemen began, eventually killing at least 16,200 civilians and creating a humanitarian crisis with a deadly cholera epidemic and 14 million people facing a possible famine, the U.S. is finally saying enough. 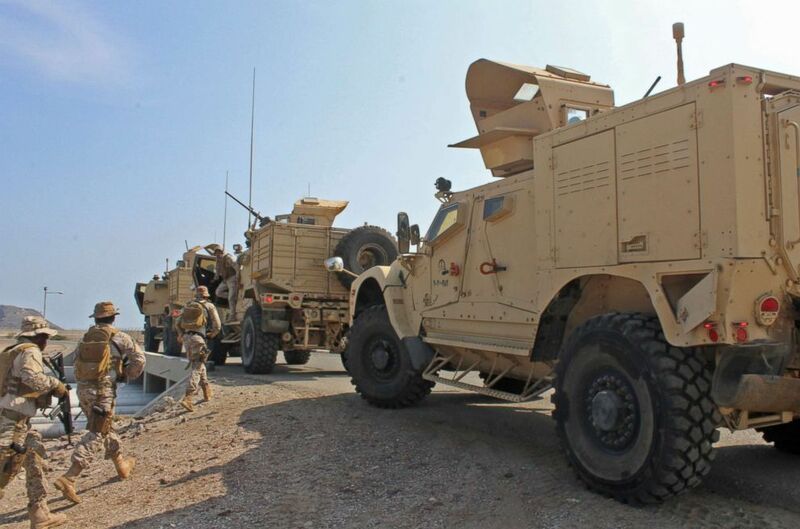 The Trump administration issued two strong statements Tuesday night to call for an end to the war between Houthi rebels, supported by Iran, and the Yemeni government, powered by U.S. allies Saudi Arabia and the United Arab Emirates. (Saleh Al-Obeidi/AFP/Getty Images) Soldiers loyal to Saudi-led coalition forces are seen in the southern Yemeni port of Aden, Oct. 29, 2018. The statements were hailed as a breakthrough by some humanitarian groups, but others warned that it must be followed by concrete actions by the U.S., which Congress has so far seen no signs of as it increases pressure on the administration to take action and end U.S. military support for the Saudi-led coalition. The new pressure from the U.S. comes as the Saudis are on the defensive for the murder of Washington Post columnist Jamal Khashoggi. State Department deputy spokesperson Robert Palladino said the two things are "unrelated," but several sources told ABC News the scrutiny of Saudi Arabia has created an opening on Yemen, with renewed focus on Saudi activity abroad and pressure on the Trump administration to curtail them. 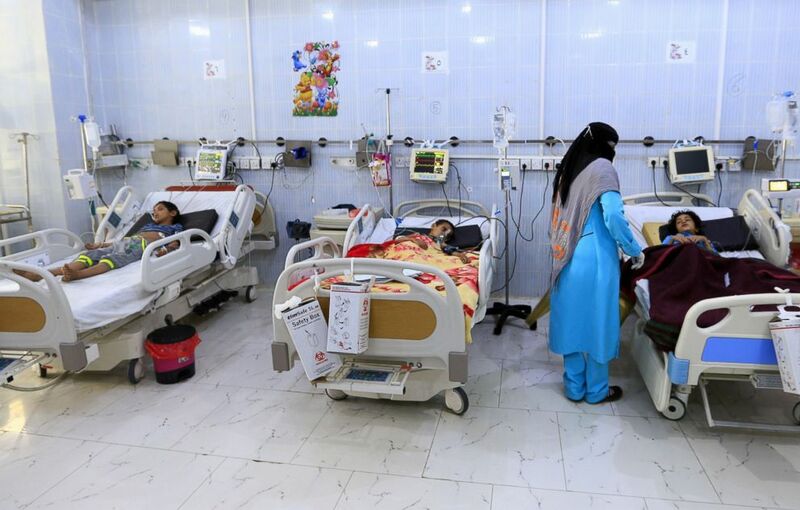 (Mohammed Huwais/AFP/Getty Images) Yemeni children suffering from a diphtheria infection receive treatment at a hospital in the capital Sanaa, Oct. 31, 2018. Yemen, which is larger than the size of California and home to more than 28 million people on the southwestern corner of the Arabian Peninsula, is on the brink of a massive famine, the scale of which the world has not seen in decades, according to experts. The Yemeni economy has collapsed, leading to sky-high prices, no income for the majority of Yemenis, and few able to afford food or other basic necessities. While the warring sides siege cities or blockade ports, the world aid delivered to the country rarely finds its way to those in need. Amid the starvation and violence, health care facilities have also been destroyed. Defense Secretary James Mattis first seemed to shift the tone Tuesday night. In strong terms, he set a deadline for a new ceasefire and talks under the auspices of United Nations Special Envoy Martin Griffiths: "30 days from now, we want to see everybody around a peace table based on a ceasefire, based on a pullback from the border and then ceasing dropping of bombs." That means the Houthis must first stop threatening Saudi Arabia and the UAE and then those two countries would halt their airstrike campaign. Both sides in the nearly four-year-old war have been accused of war crimes, but with their more sophisticated militaries, the Saudi-led coalition has been accused of indiscriminately bombing civilians and even targeting civilian infrastructure to exacerbate the humanitarian toll. The U.S. has provided support like training, reconnaissance, and mid-air refueling to the coalition. 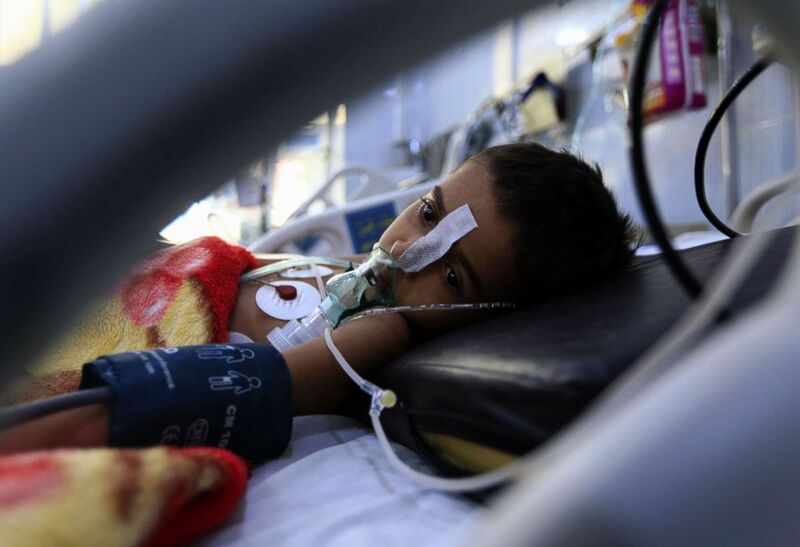 (Mohammed Huwais/AFP/Getty Images) A Yemeni child suffering from a diphtheria infection receives treatment at a hospital in the capital Sanaa, Oct. 31, 2018. Secretary of State Mike Pompeo echoed Mattis's comments in a statement released two hours later: "The time is now for the cessation of hostilities, including missile and UAV strikes from Houthi-controlled areas into the Kingdom of Saudi Arabia and the United Arab Emirates. Subsequently, Coalition air strikes must cease in all populated areas in Yemen." Together, their words signaled a change in the administration's policy -- an increase in pressure on its Saudi and Emirati allies and adding U.S. diplomatic heft to a peace process that has been largely ignored for years despite the mounting death toll and compounding humanitarian crises. 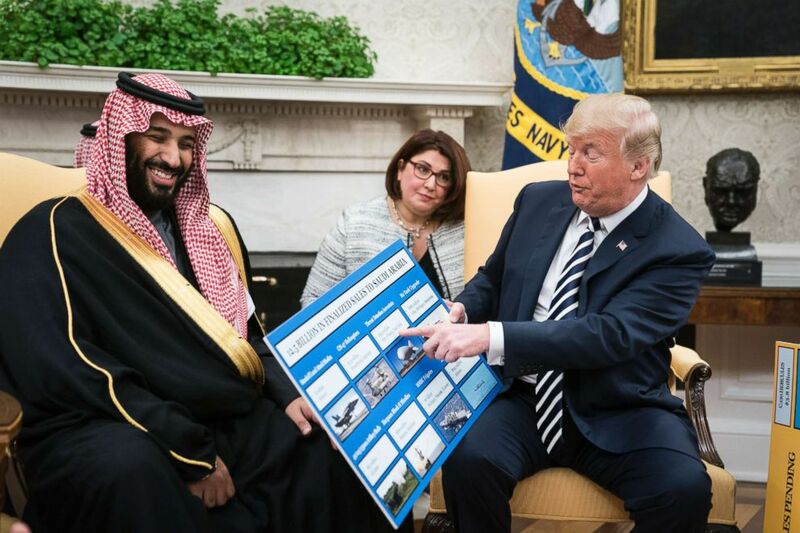 (Jabin Botsford/The Washington Post via Getty Images) President Donald Trump shows off posters as he talks with Crown Prince Mohammad bin Salman of the Kingdom of Saudi Arabia during a meeting in the Oval Office, March 20, 2018. It was hailed as "the most significant breakthrough in the war in Yemen in four years" by David Miliband, president and CEO of the International Rescue Committee, a humanitarian group working on the ground throughout Yemen. Scott Paul, Oxfam America's humanitarian policy lead who just left Yemen after an extensive visit, also welcomed the "coordinated" message as "good news ... This is best statement we’ve seen out of this administration and possibly any administration since conflict began." The new diplomatic push is underwritten by U.S. conversations with both sides of the conflict, with a U.S. official telling ABC News, "We believe that both sides are ready to sit down and negotiate in good faith." State Department spokesperson Palladino would not discuss U.S. private diplomatic conversations, but he also told reporters Wednesday, "The climate is right at this time to move forward." But it's unclear what the U.S. is doing to make that happen. One source said there was talk of a new U.N. Security Council resolution, but others said it is unlikely because it's not seen as necessary or helpful at this point. What it will not include, at least for now, is an end to U.S. military support for the Saudis and Emiratis. "The United States can stop this war if we want to. All it takes is us stopping that refueling and putting the pressure on the Saudis to stop any civilian bombing," said Rep. Ro Khanna, D-California. Since the start of the war, the U.S. has continued arms sales to both countries and assisted its warplanes. Congress demanded that the administration pull support if the Saudis and Emiratis were not taking steps to reduce civilian casualties, but last month, after a string of bombings that killed multiple children in August, Pompeo certified that they were taking steps and maintained U.S. support. The certification led to an outcry from Congress and aid groups on the ground, who said there was no evidence the coalition was doing so. "The recent certification submitted to Congress deliberately sidestepped the law and maintained the status quo where there is little accountability for indiscriminate civilian casualties," said Sen. Jeanne Shaheen, a New Hampshire Democrat, who co-authored the law requiring certification. "The humanitarian situation is dire, and it's past time for the United States to use our leverage to help end this horrific war," she added. When asked, Palladino did not say why the U.S. would continue to support the coalition militarily if it wanted to end the war -- and he dismissed questions about what steps the U.S. would take if the Saudis don't comply as a hypothetical. But that military support gives the U.S. leverage, Scott Paul of Oxfam told ABC News, saying the administration should tell the coalition, "If those talks don't happen within the 30-day window and there isn't a meaningful and good-faith effort... that U.S. support for parties won't continue or at least arm sales will be halted." If the administration does not do something like that, it is increasingly likely Congress will act instead. Rep. Khanna has introduced a war powers resolution to withdraw U.S. forces from any role in the Yemeni conflict. While his bill got little support last year, he now has the top Democrats on the House Armed Services Committee and Rules Committee as co-sponsors, along with eight other Democratic leaders. They're calling for a vote in November. Republicans are also joining them on this issue. Sen. Todd Young, R-Ind., co-authored the certification requirement law with Shaheen, while libertarian-leaning voices like Sen. Rand Paul, R-Ky., have long opposed American interventions abroad and U.S. arms sales to the Saudis. There is now a growing push on the right, including by billionaire Charles Koch and his foundation, to spread that view of the Yemeni conflict among Republicans through research, opinion pieces, polling, think tanks, and meetings with members of Congress, two sources told ABC News. While some are optimistic this may be a turning point, the administration's new push comes a month after similar diplomatic talks organized by Special Envoy Griffiths collapsed in Geneva, Switzerland. The Saudi and Emirati side blamed the Houthi rebels for not showing up, but the Houthis say that's because the coalition would not guarantee their safe travel and return. On Wednesday, Griffiths welcomed the Pompeo and Mattis statements, saying his team remains "committed to bring the Yemeni parties to the negotiations table within a month. Dialogue remains the only path to reach an inclusive agreement." While he did not detail his efforts to bring the parties together, Mattis urged all sides to "meet in Sweden in November and come to a solution." The greatest obstacle at this point seems to be the sequencing as the U.S., Saudis, and Emiratis want the Houthis to make the first move and halt their rocket attacks. Critics like Rep. Khanna say the Saudis should immediately halt bombing as "step one" because it's blocked much of the humanitarian aid from getting in. The Houthis are also fractured, and it's unclear if their leadership can guarantee a total ceasefire on their side. Their ties to Iran may also present a problem, as the Trump administration has been tightly focused on countering Iran throughout the region and prioritizing that fight over other issues. Still, some were hopeful that the moment could be ripe for action, with the situation on the verge of catastrophe, the Saudis reined in after the murder of Khashoggi, and growing outrage in the U.S. over its support. "So far, the U.S. has continued giving a green light to the war effort," Chiara Trincia, global communications officer for Miliband and the IRC, told ABC News. "This is the first time the U.S. may have stopped giving the green light. When the U.S. speaks, Saudi Arabia listens."